Motorola Moto G is an android Smartphone by Motorola Mobility. 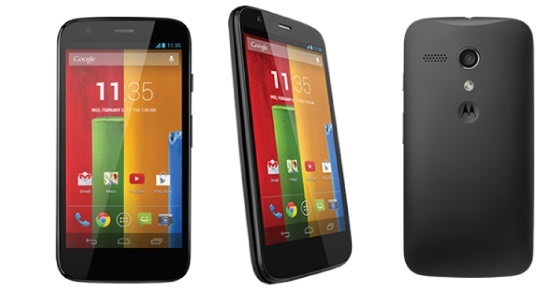 Motorola Moto G would be receiving a Guaranteed Android 4.4 KitKat. Moto G Comes with Qualcomm Snapdragon 400 Chipset with Quad-core 1.2 GHz Cortex-A7 CPU and Adreno 305 GPU. Moto G has 4.5 inches display with 720 x 1280 pixels, IPS LCD capacitive touchscreen, 16M colors. Moto G Primary Camera 5 MP, 2592 x 1944 pixels, autofocus and LED flash. Camera having feature like Geo-tagging, touch focus, face detection, HDR and panorama. Moto G also has Secondary Camera with 1.3 MP and video recording 720p@30fps, stereo sound rec, HD Recording. Motorola Moto G having Features Like SNS integration, Google Drive (50 GB storage), Active noise cancellation with dedicated mic, MP3/AAC+/WAV/Flac player, MP4/H.263/H.264 player, Organizer, Photo viewer/editor, Document viewer, Google Search, Maps, Gmail, YouTube, Google Talk, Picasa, Voice memo/dial, Predictive text input and much more. 4.5 inches, IPS LCD capacitive touchscreen, 16M colors with 720 x 1280 pixels. Li-Ion 2070 mAh battery, more than 24 hours of talk time.